Although unseen by the end customer, Ruby Has is proud to stand as an engaged partner and valuable resource for your brand. 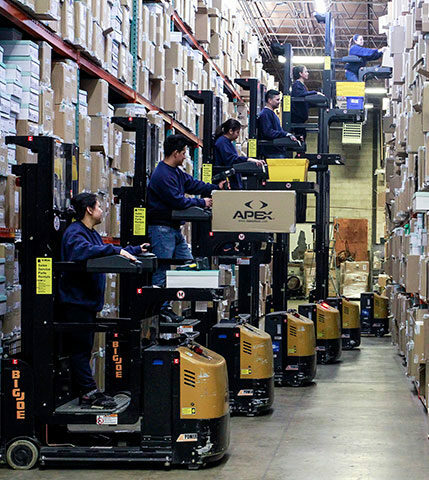 We are the ultimate fulfillment specialists and are proud to serve medium and enterprise-level businesses with accurate automation technology, convenient API integration, and bicoastal warehouse solutions. Our sales team is eager to help you build the perfect fulfillment service package. Ruby Has offers a full suite of fulfillment services to help you deliver an exceptional experience. Our highly trained, caring team members utilize powerful technology to deliver the highest accuracy rates in the industry. Automated sorting systems, powerful conveyors, and paperless RF scanners are just a few of the digital systems that empower Ruby Has’ fast, efficient service. At Ruby Has, we have more than 30 built-in API integrations. Our web-based fulfillment software allows you to check inventory, orders, and shipment status in real time, enabling seamless order flow. We extend a 100% satisfaction guarantee to you and your end customers. We guarantee the accuracy of our pick and pack fulfillment, and ensure that your packages are shipped within the required time frame.